Instead of joining everyone in ranting about how crazy the end of school is, I’ve decided to just go MIA. I watch the emails pile up in my inbox about this end-of-the-year party and that end-of-the-year party and I can’t keep track of them. I didn’t show for my oldest’s party, and I didn’t help with my youngest’s party. I didn’t even contribute food to Anne’s end-of-the-year breakfast. I am the worst end-of-the-year mom ever. But what I have been doing is trying to prepare myself for the even harder months of June and July – those months when Anne (+ the other two kiddos) are home all day. Anne requires tons of attention and time to keep her from regressing over the summer. I have to keep her mind engaged and provide new challenges. It’s work, joyful work, but work none-the-less. The one end-of-the-year event I did purpose to attend was Anne’s award’s ceremony. In fact, the whole family came! 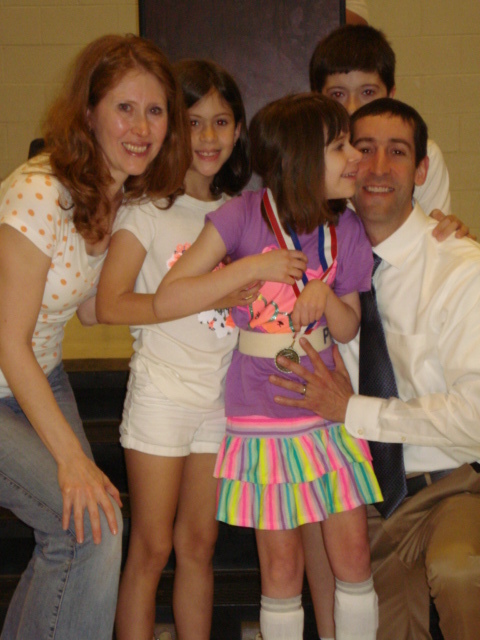 This year, her special education teacher chose Anne as the “Academic Student of the Year.” Anne was given a medal in front of 400 students. Afterward she said, “I was so embarrassed!” That statement, alone, is proof of her progress as it reveals a new level of self-awareness that we haven’t seen before! The year’s Academic Student of the Year in Ms. Adrienne’s Class is someone who has not only improved academically in all areas, but has improved in being able to work independently and in having appropriate social interactions with her classmates and teachers. In addition, this student has mastered many of her gross and fine motor skills and is starting to walk around the school building regularly with hand held adult assistance or her walker. This student’s success is attributed to not only the student working hard, but also the support she has received from a variety of teachers and therapists. Most of all, the support this student receives from her family and her church is what has helped her to achieve her goals. We are pleased to announce Anne Jackson as Academic Student of the Year. Way to Go!! We are very proud of you!! We are so proud of Anne. Thank you for your prayers and support of Anne and our family. Your support, prayers and encouragement have been multiplied through Anne so that an entire school has taken notice. May God receive all the glory! You Totally have your priorities right Kathryn. Way to go! And way to go Anne!!! Congratulations to you, Anne on getting to be Student of the Year in your class! God is good. Now we pray for a great summer–and for your family, as well. Keep us posted, Kathryn, and we continue to pray! Thanks for carrying the load for me and and all the other MIA moms out there, Joy! You are amazing! Sweet Kathryn, I am so proud of you in taking time to prepare your heart for the summer. People who don’t have a special needs child have no idea what “summers” look like. It’s not sleeping in late, lounging around eating meals whenever, etc.but it is constant stress of always making every opportunity a learning experience. Yikes this is hard and some days almost impossible to accomplish. I am praying for you that you will have tender moments with the Lord and with your family. And please don’t be so hard on yourself when you have a day that is just “blah”..
Oh Kathy… Thank you so much for your words of understanding and encouragement. You’ve walked this relentless road and are reaping a bountiful harvest. I’m encouraged by your faithfulness! Sounds spot on to me: Your “pausing”, Anne’s award, shifting awareness and changing abilities, your excitement and dread of summer ALL of it……and together, you will inch your way thru. Wonder what you’ll be looking back on and praising God for, at the end of 2 months from now, grin? You can count on it being filled with wonder, awe, challenges, fun, exhaustion and a sense of satisfaction. Wish I lived next door, I’d be thrilled to brainstorm ideas and help provide those much needed diversions and mini breaks. Thank You Lu! i love your mind and all the fun words you mix in with your thoughts. It’s priceless! Will pray for an outstanding summer of surprises from our Loving Heavenly Father. He will strengthen you, give you wisdom, and make this a time of marveling at His being the God Who is more than enough, Jehovah Jireh. I think you have your priorities straight!!! Sometimes we have to make unorthodox decisions that are actually far wiser than it appears on the surface. Good for you for not worrying about what people think, but rather, what your little people need! unorthodox. I like that word. But i’m grateful for all the other more “orthodox” moms who carry the load for moms like me! Way to go Anne!!! We love you!!! Congratulations Annie Bee! I am so proud of you and you to Kathryn. Bless you and Eric for all the hard work you do for Anne. It looks like you picked the right event to attend. With multiple kids you can’t be everywhere. I am with you. I have spent the last few weeks getting things in order for our summer. I think it is time well spent. Congratulations Anne! We’re so proud of you! You have accomplished so much this year and we love you! Be encouraged Kathryn, you did the right thing! Praying for the days ahead and for a good summer!